A city in ancient Argos, Greece, and the center of the cult of Aphrodite. 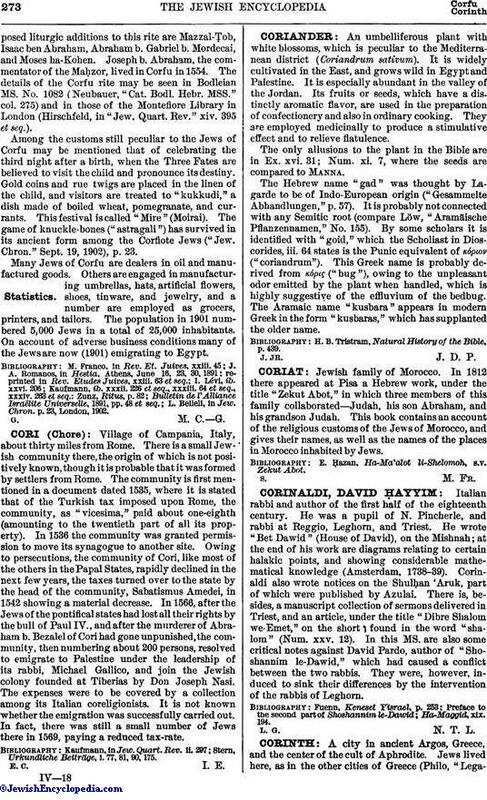 Jews lived here, as in the other cities of Greece (Philo, "Legatioad Caium," § 36), although little is known of their history. The apostle Paul preached Christianity in the synagogue of Corinth for eighteen months, and baptized the archisynagogue Crispus (I Cor. i. 14); but he was reviled by the other Jews and accused before the governor, Junius Annæus Gallio (53 C.E.). The latter, however, contemptuously declined to have anything to do with the religious quarrels of the Jews; and the populace maltreated before his eyes the archisynagogue Sosthenes (Acts xviii. 12-17), who was probably the inefficient successor of Crispus. The occurrence of this scandalous affair in the very presence of the Roman governor shows that there were a large number of Jews at Corinth. They seem to have had a preference for that city; for Aquila and his wife Priscilla, who came originally from Pontus, went to Corinth with the Jews who were driven from Rome. Silas and Timothy, also, went there from Macedonia (Acts xviii. 2-5). Pharisaic Judæo-Christians were the cause of much dissension in the young Christian community (II Cor. iii. 1, x. 13, xi. 5); for they objected to the celibacy of their Christian brethren (I Cor. vii. 1); and the Christian community was probably obliged to take a stand against the immorality that prevailed in certain circles (I Cor. v. 9-11, vi. 12-19; II Cor. xii. 21). These conditions have given rise to the modern hypothesis that the Jewish Book of Jubilees—which insists upon marital fidelity and condemns unchastity—was directed against the immorality at Corinth (Singer, "Das Buch der Jubiläen," p. 200, Stuhlweissenburg, 1898). Corinth was a great center of art, and its influence spread as far as Judea. Josephus, in describing the Temple of Solomon, mentions the Corinthian style of architecture ("Ant." viii. 5, § 2). This, however, is an anachronism, and is copied from the description of the Herodian Temple, which had a number of columns in the Corinthian style (ib. xv. 11, § 5). There were splendid Corinthian candlesticks in the palace of Agrippa II. at Tiberias (Josephus, "Vita," § 13). The Corinthian bronze that Pliny praises ("Historia Naturalis," xxxiv. 1, § 3) was prized at Jerusalem (Josephus, "B. J." 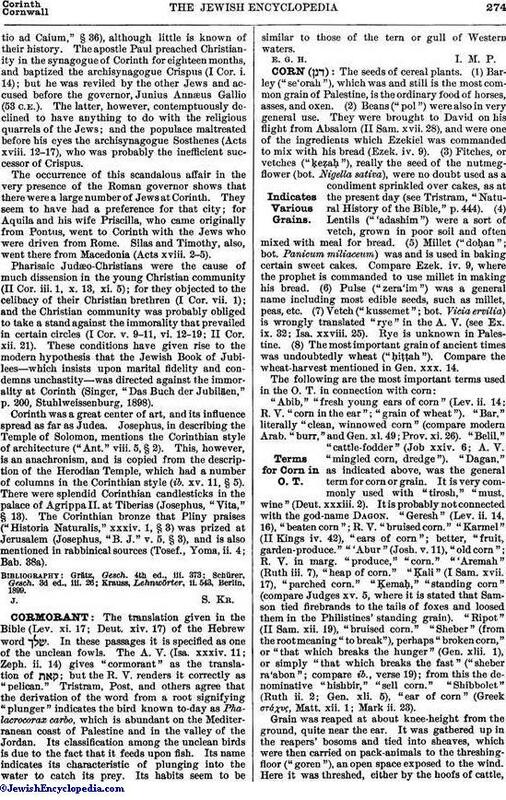 v. 5, § 3), and is also mentioned in rabbinical sources (Tosef., Yoma, ii. 4; Bab. 38a). Krauss, Lehnwörter, ii. 543, Berlin, 1899.